If you heard or said those words, occasionally or often, when you were growing up, I’d practically guarantee you’re an American. Why? Because guns — the “bang bang” producer — are in our national DNA. And playing “cowboys and Indians,” or “Civil War,” or a number of other kids’ games of that kind, automatically involved having a firearm – – real or imagined — close at hand. And when I say “real,” I mean a cap pistol, or some other kind of toy gun. NOT a real firearm, loaded or unloaded. In the many “battles” I remember participating in with other kids my age, not once do I recall anyone brandishing, let alone “firing,” a real gun. It just never happened. As you may have already guessed, the reason I’m bringing all this up is because of the recent, horrific Las Vegas massacre which left 59 people dead and hundreds wounded. Why did it happen? 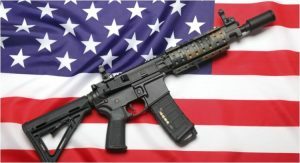 Because a man with no criminal record, and plenty of money, bought a whole trove of legal semi-automatic weapons, plus the ammunition for them, plus the “bump stocks” that supposedly made them fully automatic (an assumption I’m very skeptical of), then set up a murder site on the 32nd floor of a big hotel, and took advantage of a country music festival down below to wreak deadly havoc on hundreds. Guns date back to the earliest days of our history as a country. The Pilgrims had the primitive matchlock muskets of those days, to hunt animals to feed their families, and, when they had to, to defend themselves from the Indians. The colonists of the 1770s could not have resisted the rule of the British army, and eventually, won the Revolutionary War, without widespread ownership of firearms. The pioneers, after the Civil War, won the West and established many of our states, with the assistance of their trusty rifles and handguns. And all of this has been depicted in our live plays, our silent movies, our sound movies, where the loud “Bang bang!” of the guns would thrill the audiences; and made-for-TV Westerns, and detective shows. Remember “The Rifleman”? The vast majority of the privately-owned firearms in this country today, are either owned for self protection; or hunting; or target shooting. The number held by criminals, for evil purposes (like the sky-high murder rate among, mostly, the blacks in Chicago), is very low, compared to the legitimate uses. And of course, if you believe the Democrats in Congress and elsewhere, more restrictive gun laws would have made it virtually impossible for the assassin in Las Vegas to have committed his heinous crime. And if you believe that, I’ve got a huge, beautiful lake I’ll sell you, in the middle of the Gobi Desert. The National Rifle Association, which is absolutely hated by the Left, always says that if the gun-control laws already on the books (and we’ve got a bunch of them) were properly enforced, the gun-deaths rate would plummet. And personally, I think they’ve got a good point there. The NRA’s take on guns in America could be summed up thusly: We believe in and support the Second Amendment, without exception. We believe that anyone who doesn’t have a criminal record or some other disqualifying blemish in their history, should be able to purchase any legal firearm. And in any number they want, too. These liberals who say, “Nobody needs 30 guns (or 20, or 50, whatever),” know little to nothing about guns, or about gun collectors. To a serious gun owner, guns can be like priceless paintings to an art lover. There’s no such thing as “too many,” if you can afford them, and are legally entitled to buy them. But here’s another thing. The NRA is also highly supportive of training in the safe use of firearms, and conducts it regularly. Any NRA member would probably agree that anyone who leaves a loaded handgun laying around in their home, where small children are also living, knows nothing about gun safety and is an idiot, besides. The Left isn’t really all that concerned about “public safety” being strengthened by making gun laws more restrictive. That’s their excuse for their decades-long campaign to make guns less accessible. So where are they REALLY headed with this? Everybody who doesn’t know, stand on your head. Yes, fellow gun owners, the Left, meaning mostly the Democrats, wants to gradually take away all your guns. They’re going about it like the guy who put the live lobster in a saucepan full of room-temperature water. The lobster splashed around, happy as a clam, so to speak, for a while. Then the man gradually turned the heat up on the burner, a little bit at a time. By the time the lobster suddenly thought, “Man, it’s getting hot in here!”, he was cooked. That’s what the Left wants to happen to us, fellow gun owners. By the time we realize what they’re up to, they think, they’ll have all our guns, and WE’LL be cooked. Well, I don’t think that could be accomplished, even if a federal government was ever elected that would attempt to do such a thing. For one thing, there are over 300 million firearms in this country in private hands. 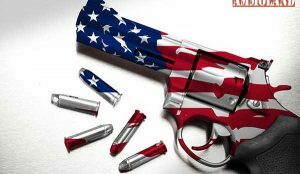 Can you imagine American gun owners all handing their firearms over, qu ietly and fearfully, to a federal confiscation? If we’ve got way too many gun deaths now — and yes, we do — then do the anti-gun zealots think that federal agents coming to “collect all the guns” wouldn’t get shot down by the thousands by Americans not willing to give up their legal firearms? Some anti-gun politicians will try to tell you that half of the 300 millions firearms are owned by just one percent of the population. That’s nonsense, too. By the way, do you own any firearms? If somebody asks you that, who has no business knowing the answer, here’s my advice: Tell them you don’t discuss that. I was asked that once at my place of employment, and without thinking I told the truth. I have cause to believe that my answer may have been a factor in my being dismissed from my job later. Should I have lied? No, of course not. But I should have said to my supervisor, “Why on earth would you ask me that?,” and gone on with my work. My reading of the Second Amendment is, if you have no criminal record, and you’ve gone through the proper channels required in your state for gun ownership, AND if you have taken any required gun safety training, then you have the right to own a firearm. Or a hundred of them. Guess I couldn’t state it any clearer than that, could I? What’s that? Do I own any guns? HA! Wouldn’t you like to know! You are so right, Old Corporal. Guns do not kill people. PEOPLE kill people. Great article. Well done!